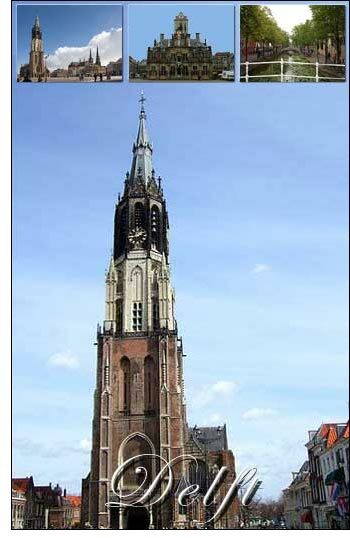 The city of Delft is located in Zuid Holland (South Holland) close to Rotterdam and Den Haag (The Hague). Around 100,000 people live in Delft. The city received its city rights in the 13th century. The city is situated on the Schie, which flows into the Meuse at Delfshaven. The town was almost totally destroyed by fire in 1536, and in 1654 it was seriously damaged by the explosion of a powder-magazine; but it still possesses numerous interesting buildings of the 16th century, especially at the Wynhaven and in the Koornmarkt and Voorstraat. Delft was the birthplace of: Hugo de Groot (also known as Grotius; 1583-1645), the statesman and scholar, who laid the foundations for international law. The painters M. van Mierevelt (1567-1641) and Jan Vermeer van Delft (1632-1675). One of Vermeer's most famous paintings is called "View of Delft", depicting his home town. Anthony van Leeuwenhoek, inventor of the microscope. In the 17th and 18th century, "Delft's Blauw" (Delft Blue, Delft pottery), made in imitation of Chinese and Japanese porcelain, was celebrated throughout Europe. This industry afterwards fell into decay but some of it has been revived. A melancholy celebrity attaches to the Prinsenhof, on the Oude Delft, as the scene of the death of Prince Willem van Oranje (William of Orange), the founder of Dutch independence, who was assassinated here on the 10th July, 1584. The Prinsenhof, previously a monastery, was fitted up in 1575 as a residence for the princes of Orange and was afterwards long used as a barrack. The building has been restored and is open to the public. By passing through the door opposite the tower of the Oude Kerk and crossing the court, we reach the spot where the tragedy took place, on the first floor, to the right by the stair­case. It is marked by an inscription. The murderer, a Burgundian named Balthasar Gerards, who was prompted by a desire to gain the price set upon the hero's head by Alexander Farnese, took up his position in front of the spot thus indicated, and when he discharged his pistol was quite close to his victim, who was ascending the staircase with his friends. Opposite the Prinsenhof, on the site of an earlier church, is situated the Gothic Oude Kerk, erected after 1250, with a somewhat leaning tower and wooden vaulting of 1574. The choir of the Nieuwe Kerk, formerly the Church of St. Ursula, in the Groote Markt, another Gothic edifice, built in 1396-1496, contains a magnificent monument by Hendrik de Keyser (1608-19), erected by the United Provinces to the memory of William of Orange. The tower is 375 ft. in height. In the market-place, in front of the church, is a bronze statue of Hugo Grotius, by Th. Stracké, erected in 1886. The Stadhuis, on the west side of the Market-place, restored in the Renaissance style by H. de Keyser after a fire in 1618, has an ancient Gothic belfry.